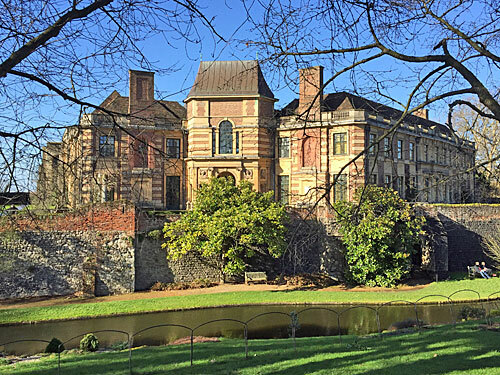 To say Eltham Palace is unexpected would be an understatement. You don't expect to find a royal palace in the Greenwich suburbs. You don't expect to have to cross a moat to reach it. 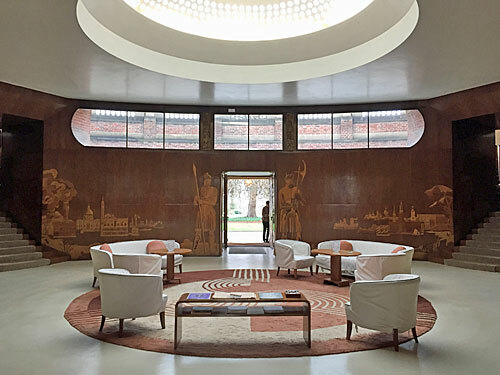 You don't expect the entrance hall to be a glorious Art Deco triumph. You don't expect to walk through what feels like a 1930s hotel. And you definitely don't expect to exit an upstairs corridor into a medieval minstrels gallery... although sorry, you will expect all of that now I've told you. That the palace exists is down to a succession of medieval monarchs, including Edward IV who gave orders for the Great Hall to be built, making this a favoured spot for royal stopovers. Henry VIII spent part of his childhood here, no less. 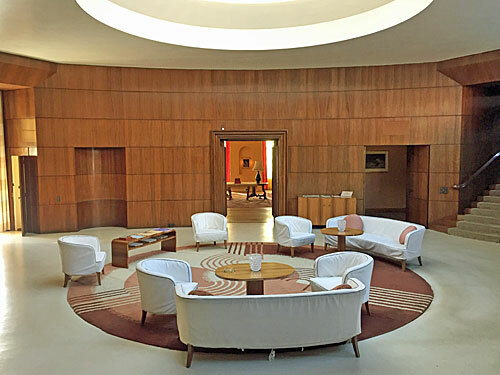 That the house is stunning is down to two wealthy socialites, Virginia and Stephen Courtauld, who rescued the derelict site and tacked their own idiosyncratic mansion on the side. Alas they only moved in in 1936, leaving just four summers to enjoy their hideaway before the first WW2 bombs fell, and by 1944 they'd sold up and moved on. English Heritage have owned the place since 1995, and set about opening it up to the public. That used to mean entering via the servants' corridor and slipping on plastic bootees to protect the floors, but the current revamped offering dispenses with footwear protection and invites you straight into the entrance hall. 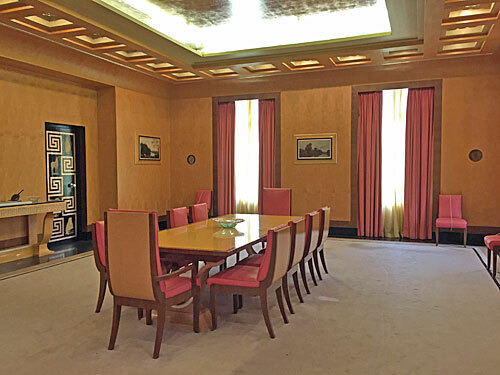 For some visitors, this is their favourite room in London. Approximately triangular in shape, the walls are curved to give the illusion of something more circular. Alluring Scandi chairs and sofas curl around a central rug (which visitors absolutely must not step upon, embarrassing parents whose excitable offspring are incapable of following a simple instruction). Light floods in through a dome embedded with loops of glass tiles, hovering above like a spotty flying saucer. The walls are panelled blackbean veneer, illustrated with maritime European landscapes. Various stairwells, rooms and corridors lead off in all directions, this hall being the central 'hinge' where the two wings of the building join. And hidden at the rear are a tiny room for flower arranging, and an alcove with a coin-op telephone with those newfangled A and B buttons. The whole thing screams lush Swedish design (or "you must run around on the carpet", depending on your age). The tour starts upstairs with an introductory film, in period style rather than dryly factual, and then you're let loose with your audio-visual gizmo. The gizmo's good, assuming you don't get your button-pressing in a twist, and allows the house to be disfigured by a minimum of information boards. You may, however, be sick of hearing about the lemur by the end of the tour - the Courtaulds had one as a pet, and it lived in a cage on an upper landing accessed via a bamboo ladder. Stephen and Ginie had separate bedrooms linked by a 'secret' door. 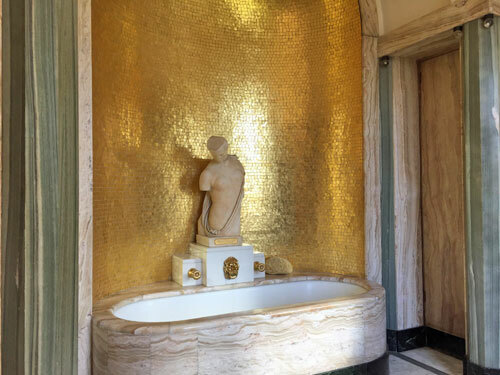 Ginie's is the more glamorous, not least the decadent bathroom with a marble tub and gold leaf tiles. This is where visiting out of season or on a weekday pays off - I had her lustrous splashbacks to myself, whereas at the weekend the smaller rooms can get a bit shuffly. 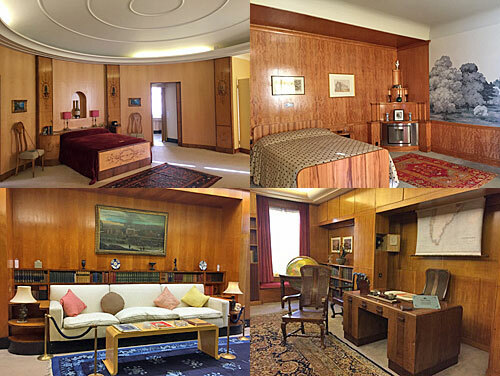 That's also the case downstairs, particularly in Stephen's library and the tiny map room at the back of the boudoir, which is also the place to go if you've ever wanted to see a leather map of the Eltham area with a functional clock embedded in the top right hand corner. 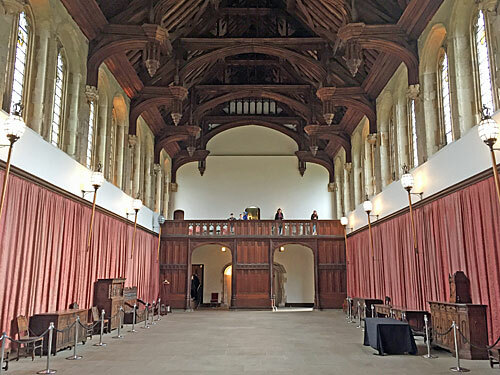 The Great Hall appears with a jolt, like walking from a Poirot whodunnit into some codpiece melodrama. In truth the stained glass and ornate screens are modern additions, but most of the oak hammerbeam roof would have been up there when English kings enjoyed their Christmas dinners underneath. It also made a magnificent setting for pre-war entertaining - a swirl of dancing and cocktails - and is now where the half term entertainer whips out his Sainsbury's bag of tricks to keep your littl'uns occupied. The other dazzler is the dining room, with a shimmering aluminium ceiling and doors illustrated with zoo animals and Egyptian patterns. But the front-of-house magic vanishes somewhat after you head out down the servants' corridor and stairs into the basement, following the pipes to rooms used for wartime shelter and the playing of billiards. The Courtaulds put their all into the local war effort, but eventually the bombing became too much and they abandoned Eltham for Rhodesia instead. Which leaves the gardens, which are also excellent, if not at their best in February. A walk around both sides of the moat will cover it, the far flank currently requiring decent shoes, but for this you get to walk underneath one of the (if not the) oldest functional medieval bridges in London. 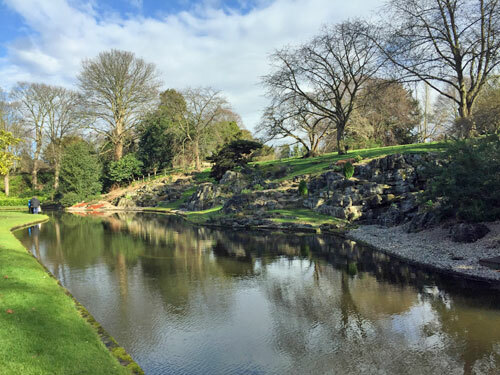 The rock garden is arrayed to look resplendent from upstairs, while the rose garden is supposed to resemble an outdoor room. Some of the farthest reaches are now a car park, plus the welcome centre and gift shop where non-members need to buy their tickets. The earlier in the day you can visit the better, I'd say, if you want to swan around like royalty rather than one of the hoi polloi.